As a person who considers himself part of the thriving clown protest business, I have a vested interest in defending the nobility of the red nose. Furthermore, much as I think charity is a good thing, it falls to me to defend the culture of those who don red noses for entertainment purposes from those who’d co-opt the scarlet schnozz for reasons of mendacity. 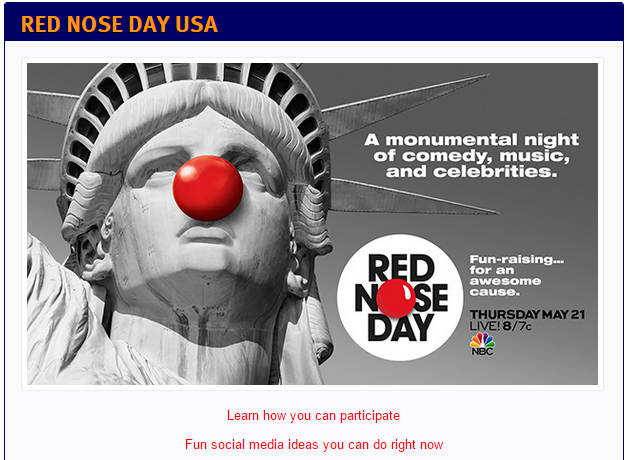 The ‘red nose day’ event to provide money for children in poverty is underwritten by some interesting actors. Comic Relief UK (once affiliated with COMIC Relief as seen on HBO) took a pasting last year when a BBC documentary revealed they were heavily investing donor money in tobacco and arms companies. Comic Relief USA is no more–it’s the Tahoe Institute since 2014, and there’s no info about its policies or practices on Wikipedia. As for NBC (which is donating the broadcast time), NBC is owned by General Electric,which has paid a -9% tax rate between 2008 and 2013 (they not only didn’t pay in, they gamed the system to get billions back). GE has the honor of being #1 on Bernie Sanders’ list of tax evaders in the US. Additionally, GE is a leader in off-shoring jobs from the US. If GE wanted to make the lives of poor American children better, they could stop off-shoring US jobs to China. They could also put in a few billion of the money they didn’t pay in taxes to help cover the cuts in SNAP and other benefit programs for children. Okay, I’m being cranky here. That doesn’t mean I’m wrong. If I’ve gotten some of the facts incorrect, I will issue a correction. But child poverty in the US isn’t some accident. huge numbers of jobs have been sent away, and the ones that have remained can’t keep families fed. People are working jobs that no longer pay the level of income that the briar-hoppers used to make. You’re already paying some $6.2 billion in extra taxes for family assistance so that Walmart can continue to pay poverty wages. That’s from Forbes, hardly a socialist rag. And if you want to talk about poor people in Africa or Asia, you might want to bring up the fact that (per the NGO DARA) upwards of FIVE MILLION PEOPLE in sub-Saharan Africa and parts of South Asia are dying each year owing to global warming. Children are especially vulnerable to starvation and the effects of drought. Fixing THAT problem would require us to elect some politicians who think that climate chaos is caused by humans. Might I suggest you help out my friend Jerry instead? Jerry is spearheading a campaign to buy up and wipe out medical debt in the US. Medical debt is still the #1 driver of bankruptcy here in the US, and most of the people so bankrupted have insurance–just not the right insurance. Under RIP Medical Debt, the debt is bought for pennies on the dollar and then dismissed. Check out the link for more info.